The site of Llanlleonfel church dates back to early Roman times when a branch of the roman road connecting Neath and Chester ran past the church. A gravestone inscribed in ancient latin is now situated in the church by the lectern. 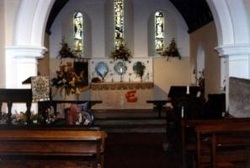 worship before a more substantial building was erected in the 16th century. of the family to live at Garth was Judge Gwynne, who bought the Manor of Garth towards the end of the 17th century. In 1716 Marmaduke Gwynne, the judge's son, presented a bell which can now be seen beside the font and in 1730, he also gave a distinctive silver chalice and paten to the church. Three memorial tablets dedicated to the Gwynne family can be seen on the west wall. The most noteworthy event which happened at Llanlleonfel church was the marriage of Sally Gwynne in 1749 to the well known Methodist hymn writer, Charles Wesley. The ceremony was performed by John Wesley who established the Methodist church. The wedding party walked for half a mile across the fields from Garth House. The fortunes of the Gwynnes and the state of the church deteriorated in the following years and in 1873 the Rev. Francis Kilvert noted in his diaries "the ruined church tottered lone upon a hill in desolate silence. The only occupants being several white owls". The church was rebuilt in 1876 with the bell tower positioned in the centre of the church, but this was later rebuilt on the west wall. 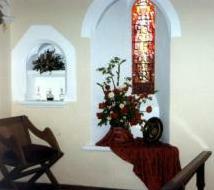 The three stained glass windows in the east wall are in memory of the Fuller-Maitland family who lived at Garth House after the Gwynnes and, in the south wall, by the altar rail, is a stained glass window in memory of Commander and Mrs Alec Wilson, whose family now live at Garth House. from Garth, which is on the A483, and 6 miles west of Builth Wells. After passing through Garth, (going towards Llandovery) continue for about half a mile and you will find a small sign directing you up a farm track on the left hand side. Please note that it is difficult to see the church from the main road because it is hidden by trees!